Be member of the AkkuFresh® Promoter Club and Get your instant 20% discount! Get your lifetime replacement warranty! We would appreciate if you would take a few minutes and register your product. This allows us to send you (with your permission) important updates, service information and helpful hints and we offer 30 days money back guarantee & lifetime replacement warranty on a registered product. Our company values your privacy and will never share your information with other firms. Read QR pattern with QR-Code Reader App. The QR-Code Reader App will guide you to our website where you can register your AkkuFresh® Next Generation™ foil. Don't forget... Do more, with us the fun never ends! Like us on the Facebook! AkkuFresh® Next Generation Nanotech Battery Life Foil - single package Package of the product: It..
AkkuFresh® Next Generation Nanotech Battery Life Foil - double package Package of the product: It..
AkkuFresh® Next Generation Nanotech Battery Life Foil - family package (10 pcs) Package of the pro..
Nanotech Battery Life Foil - small business package I.
AkkuFresh® Next Generation Nanotech Battery Life Foil - small business package (50 pcs) Package of..
AkkuFresh® Next Generation™ is compatible with any brand and type of portable devices. Trough the collection of user testimonials and success stories what we receive time-to-time from our users we know that they are using our product with many different brands of portable devices. Here are some of the brands they are using with AkkuFresh® Next Generation™ to speed up the charge time, extended usable time, slows down the loss of capacity of batteries and to achieve improved battery performance. Improves the charging capabilities of your mobile device. Lets you talk longer on your smart phone and provides additional stand-by time. Reduces the time it takes to fully charge your device. Enhances your old battery by restoring it to its original performance. Eliminates further deterioration of your battery. 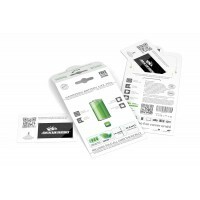 Provides you with a Green solution by prolonging your battery lifespan and reducing the time spent to charge it. Protects your battery from current fluctuations. Can be installed in seconds. Saves you money by delaying the buying of new batteries. AkkuFresh® Next Generation™ was distributed on six continents through its global network of authorised retailers, GSM service provider partnerships, and at mobile shops. More than 3.5 million AkkuFresh® Next Generation™ units have already been sold worldwide. The top Korean online shopping store, G Market, has named it as one of its ‘Top Five Most Popular Devices’ for 2014. Now, the major direction is distributing of AkkuFresh® Next Generation™ units through the AkkuFresh® Promoter Club (APC). In excess of 15-billion batteries are thrown away each year. AkkuFresh® Next Generation™ can extend the lifespan of a battery by up to three times, resulting in a more environmentally friendly market. Be member of the AkkuFresh® Promoter Club (APC), Get your instant 20% discount and help us in the dissemination of AkkuFresh® technology! AkkuFresh® Next Generation enhances the charging ability of your mobile electronics device. Provides you with more talk time and longer standby time with your smart phone. Shortens your charging time and reduces the charging frequency, which saves on power. Revitalises your worn out or deteriorated batteries by restoring it to its original performance. Increases the total lifespan of your battery. Eliminates the battery "memory” effect (only on Ni-CD batteries). Protects your battery from electrical variations by regulating and filtering the current. Easy to use and can be installed in seconds. Saves you money by making your battery last longer. AkkuFresh® Next Generation™ is based on ionXtra-Power® technology, an exclusively developed nano-ceramic material that is the result of more than ten years of laboratory research. AkkuFresh® Next Generation™ is the perfect companion to the modern mobile device that caters for all your connectivity requirements whether it is social media updates, high-definition photography, mobile gaming, or browsing the internet. In addition, the foil works on old and new rechargeable batteries. It slows down the capacity loss of your Li-ion and Li-polymer cells, thereby improving the battery performance. AkkuFresh® Next Generation™ not only improves the time it takes for the battery of your mobile device to recharge but it also helps to maintain optimal battery life. The innovative technology solution regenerates any of your worn out or deteriorated batteries. It absorbs all sources of energy, including the electromagnetic field (EMF) energy and transforms them naturally into negative ions and long wave infrared rays as absorbable energy form by battery. The newly generated AkkuFresh® negative ions will penetrate into the battery and create a higher frequency, causing the build up of crystals to resonate and burst. This enables the battery to regain its initial capacity and enhance the flow of negative ions. In addition, it lets the lithium-ions resonate, providing an increase in voltage. 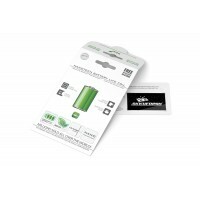 AkkuFresh® Next Generation™ is a small rectangular shaped foil (1.14-inch x 1.97-inch / 29mm x 50mm size, and 0.005-inch / 0.125mm thin) that can be quickly and easily attached to your device or the battery itself. Company name: Smartb Co., Ltd.
AkkuFresh® name logo and ionXtra® name and logo are registered trademarks of Kent Holdings Ltd. © 2003-2017 - All Rights Reserved.